"The McClure Gallery is pleased to open its new season with a solo exhibition of recent works by Montreal artist Matt Shane. 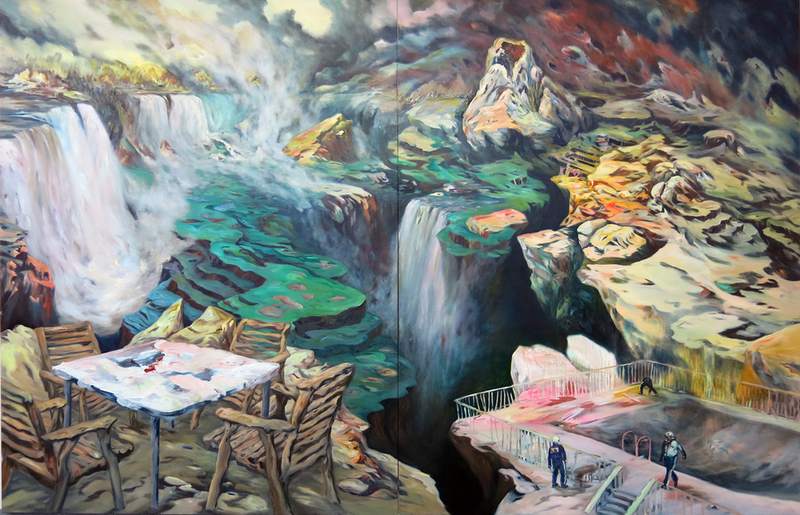 Impassable Chasm presents two mural sized paintings and a selection of smaller landscapes. If it can be said that the artist’s work is anchored in the landscape tradition, it is also uniquely inhabited by industrial sites and utopian architectural forms. Matt Shane’s landscapes are active grounds, full of tension and opposition. Their detailed scope and sweeping perspectives refer to 19th century landscapes by European Romantic painters and the Hudson River School. Yet, while these painters strove to depict sublime and pastoral versions of nature, Shane’s work displays ominous signs of development: mines, cities, parking lots. They couple the sublime with a sense of anxiety regarding the scale of human impact on the environment. As the artist embodies these places, he tries to make sense of them, while simultaneously keeping them wondrous and strange. Painting, for Shane, is like traveling. It involves a reliance on intuition, but also a willingness to relinquish control and to slip into sensory forms of logic. Using colour, texture, form and line, he charts out a mutable frontier, where natural and man-made forces meet and bleed together. The pictorial worlds presented at the McClure Gallery can be situated somewhere at the border of geography and imagination."